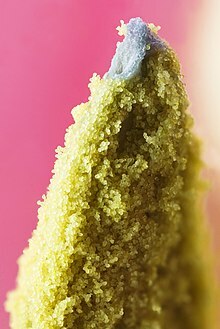 A successful angiosperm pollen grain (gametophyte) containing the male gametes is transported to the stigma, where it germinates and its pollen tube grows down the style to the ovary. Its two gametes travel down the tube to where the gametophyte(s) containing the female gametes are held within the carpel. One nucleus fuses with the polar bodies to produce the endosperm tissues, and the other with the ovule to produce the embryo Hence the term: “double fertilization“. More commonly, pollination involves pollinators (also called pollen vectors): organisms that carry or move the pollen grains from the anther of one flower to the receptive part of the carpel or pistil (stigma) of another. Between 100,000 and 200,000 species of animal act as pollinators of the world’s 250,000 species of flowering plant. The majority of these pollinators are insects, but about 1,500 species of birds and mammals visit flowers and may transfer pollen between them. Besides birds and bats which are the most frequent visitors, these include monkeys, lemurs, squirrels, rodents and possums. bumblebees (Bombus spp. ), and butterflies (e.g., Thymelicus flavus) have been observed to engage in flower constancy, which means they are more likely to transfer pollen to other conspecific plants. This can be beneficial for the pollinators, as flower constancy prevents the loss of pollen during interspecific flights and pollinators from clogging stigmas with pollen of other flower species. It also improves the probability that the pollinator will find productive flowers easily accessible and recognisable by familiar clues. Bees provide a good example of the mutualism that exists between hymenopterans and angiosperms. Flowers provide bees with nectar (an energy source) and pollen (a source of protein). When bees go from flower to flower collecting pollen they are also depositing pollen grains onto the flowers, thus pollinating them. While pollen and nectar, in most cases, are the most notable reward attained from flowers, bees also visit flowers for other resources such as oil, fragrance, resin and even waxes. It has been estimated that bees originated with the origin or diversification of angiosperms. In addition, cases of coevolution between bee species and flowering plants have been illustrated by specialized adaptations. For example, long legs are selected for in Rediviva neliana, a bee that collects oil from Diascia capsularis, which have long spur lengths that are selected for in order to deposit pollen on the oil-collecting bee, which in turn selects for even longer legs in R. neliana and again longer spur length in D. capsularis is selected for, thus, continually driving each other’s evolution. Pollination management is a branch of agriculture that seeks to protect and enhance present pollinators and often involves the culture and addition of pollinators in monoculture situations, such as commercial fruit orchards. The largest managed pollination event in the world is in Californian almond orchards, where nearly half (about one million hives) of the US honey bees are trucked to the almond orchards each spring. New York‘s apple crop requires about 30,000 hives; Maine‘s blueberry crop uses about 50,000 hives each year. The US solution to the pollinator shortage, so far, has been for commercial beekeepers to become pollination contractors and to migrate. Just as the combine harvesters follow the wheat harvest from Texas to Manitoba, beekeepers follow the bloom from south to north, to provide pollination for many different crops. Butterflies too have suffered due to these modifications. Butterflies are helpful ecological indicators since they are sensitive to changes within the environment like the season, altitude, and above all, human impact on the environment. Butterfly populations were higher within the natural forest and were lower in open land. The reason for the difference in density is the fact that in open land the butterflies would be exposed to desiccation and predation. These open regions are caused by habitat destruction like logging for timber, livestock grazing, and firewood collection. Due to this destruction, butterfly species’ diversity can decrease and it is known that there is a correlation in butterfly diversity and plant diversity. Besides the imbalance of the ecosystem caused by the decline in pollinators, it may jeopardise food security. Pollination is necessary for plants to continue their populations and 3/4 of the world’s food supply are plants that require pollinators. Insect pollinators, like bees, are large contributors to crop production, over 200 billion dollars worth of crop species are pollinated by these insects. Pollinators are also essential because they improve crop quality and increase genetic diversity, which is necessary in producing fruit with nutritional value and various flavors. Crops that do not depend on animals for pollination but on the wind or self-pollination, like corn and potatoes, have doubled in production and make up a large part of the human diet but do not provide the micronutrients that are needed. The essential nutrients that are necessary in the human diet are present in plants that rely on animal pollinators. There have been issues in vitamin and mineral deficiencies and it is believed that if pollinator populations continue to decrease these deficiencies will become even more prominent. ^ a b Runions, C. John; Owens, John N. (1999). “Sexual reproduction of interior spruce (Pinaceae). I. Pollen germination to archegonial maturation”. International Journal of Plant Sciences. 160 (4): 631–640. doi:10.1086/314170. ^ Ackerman, J. D. (2000-03-01). “Abiotic pollen and pollination: Ecological, functional, and evolutionary perspectives”. Plant Systematics and Evolution. 222 (1–4): 167–185. doi:10.1007/BF00984101. ^ Whitehead, Donald R. (1969). “Wind Pollination in the Angiosperms: Evolutionary and Environmental Considerations”. Evolution. 23 (1): 28–35. doi:10.2307/2406479. JSTOR 2406479. PMID 28562955. ^ Culley, Theresa M.; Weller, Stephen G.; Sakai, Ann K. (2002-08-01). “The evolution of wind pollination in angiosperms”. Trends in Ecology & Evolution. 17 (8): 361–369. doi:10.1016/S0169-5347(02)02540-5. ^ Friedman, Jannice; Barrett, Spencer C. H. (2009-06-01). “Wind of change: new insights on the ecology and evolution of pollination and mating in wind-pollinated plants”. Annals of Botany. 103 (9): 1515–1527. doi:10.1093/aob/mcp035. PMC 2701749. PMID 19218583. ^ a b Cox, Paul Alan (1988). “Hydrophilous Pollination”. Annual Review of Ecology and Systematics. 19: 261–279. doi:10.1146/annurev.es.19.110188.001401. JSTOR 2097155. ^ Fan, Xu-Li; Barrett, Spencer C. H.; Lin, Hua; Chen, Ling-Ling; Zhou, Xiang; Gao, Jiang-Yun (2012-10-01). “Rain pollination provides reproductive assurance in a deceptive orchid”. Annals of Botany. 110 (5): 953–958. doi:10.1093/aob/mcs1654 (inactive 2019-03-11). ^ Aguiar, João M. R. B. V.; Pansarin, Ludmila M.; Ackerman, James D.; Pansarin, Emerson R. (2012). “Biotic versus abiotic pollination in Oeceoclades maculata (Lindl.) Lindl. (Orchidaceae)”. Plant Species Biology. 27 (1): 86–95. doi:10.1111/j.1442-1984.2011.00330.x. ^ “Types of Pollination, Pollinators and Terminology”. CropsReview.Com. Retrieved 2015-10-20. 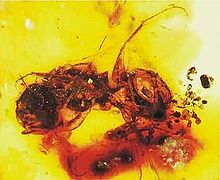 ^ “First ever record of insect pollination from 100 million years ago”. ScienceDaily. Retrieved 2015-10-20. ^ Rodríguez-Gironés, Miguel A.; Santamaría, Luis (2004). “Why are so many bird flowers red?”. PLoS Biology. 2 (10): e306. doi:10.1371/journal.pbio.0020350. PMC 521733. PMID 15486585. ^ Hill, P. S. M.; Wells, P. H.; Wells, H. (1997). “Spontaneous flower constancy and learning in honey bees as a function of colour”. Animal Behaviour. 54 (3): 615–627. doi:10.1006/anbe.1996.0467. ^ Stout, J. C.; Allen, J. A.; Goulson, D. (1998). “The influence of relative plant density and floral morphological complexity on the behaviour of bumblebees”. Oecologia. 117 (4): 543–550. doi:10.1007/s004420050691. PMID 28307680. ^ Chittka, L.; Gumbert, A.; Kunze, J. (1997). “Foraging dynamics of bumble bees: correlates of movement within and between plant species”. Behavioral Ecology. 8 (3): 239–249. doi:10.1093/beheco/8.3.239. ^ Goulson, D.; Ollerton, J.; Sluman, C. (1997). “Foraging strategies in the small skipper butterfly, Thymelicus flavus: when to switch?”. Animal Behaviour. 53 (5): 1009–1016. doi:10.1006/anbe.1996.0390. ^ Harder, L. D.; Williams, N. M.; Jordan, C. Y.; Nelson, W. A. “The effects of Floral design and display on pollinator economics and pollen dispersal”. 297–317. ^ Chittka, L.; Thomson, J. D.; Waser, N. M. (1999). “Flower constancy, insect psychology, and plant evolution”. Naturwissenschaften. 86 (8): 361–377. doi:10.1007/s001140050636. ^ Dressler, Robert L. (1968-03-01). “Pollination by Euglossine Bees”. Evolution. 22 (1): 202–210. doi:10.2307/2406664. JSTOR 2406664. PMID 28564982. ^ Fleming, Trish; Nicholson, Sue. “Who is pollinating Pr humiflora”. Archived from the original on 2013-02-19. ^ Goldingay, R. L.; Carthew, S. M.; Whelan, R. J. (May 1991). “The Importance of Non-Flying Mammals in Pollination”. Oikos. 61 (1): 79–87. doi:10.2307/3545409. JSTOR 3545409. ^ Sühs, R.B. ; Somavilla, A.; Putzke, J.; Köhler, A. (2009). “Pollen vector wasps (Hymenoptera, Vespidae) of Schinus terebinthifolius Raddi (Anacardiaceae)”. Brazilian Journal of Biosciences. 7 (2): 138–143. ^ Culley, Theresa M.; Klooster, Matthew R. (2007). “The cleistogamous breeding system: a review of its frequency, evolution, and ecology in angiosperms”. The Botanical Review. 73: 1–30. doi:10.1663/0006-8101(2007)73[1:TCBSAR]2.0.CO;2. ^ Igic B, Kohn JR (May 2006). “The distribution of plant mating systems: study bias against obligately outcrossing species”. Evolution. 60 (5): 1098–103. doi:10.1554/05-383.1. PMID 16817548. ^ W. Scott Armbruster (2012). “3”. In Patiny, Sébastien. Evolution of Plant-Pollinator Relationships. Cambridge, UK: Cambridge University Press. pp. 45–67. ^ Cardinal, Sophie; Danforth, Bryan N. (2013). “Bees diversified in the age of eudicots”. Proceedings of the Royal Society. 280 (1755): 20122686. doi:10.1098/rspb.2012.2686. PMC 3574388. PMID 23363629. ^ Steiner, Kim E.; Whitehead, V. B. (September 1990). “Pollinator adaptation to oil-secreting flowers—Rediviva and Diascia”. Evolution. 44 (6): 1701–1707. doi:10.2307/2409348. JSTOR 2409348. PMID 28564320. ^ Shao, Z.-Y. ; Mao, H.-X. ; Fu, W.-J. ; Ono, M.; Wang, D.-S.; Bonizzoni, M.; Zhang, Y.-P. (2004-01-01). “Genetic Structure of Asian Populations of Bombus ignitus (Hymenoptera: Apidae)”. Journal of Heredity. 95 (1): 46–52. doi:10.1093/jhered/esh008. PMID 14757729. ^ “US Forest Department: Pollinator Factsheet” (PDF). Retrieved 2014-04-18. ^ Biesmeijer, JC; Roberts, SPM; Reemer, M; Ohlemuller, R; Edwards, M; Peeters, T; et al. (2006). “Parallel declines in pollinators and insect-pollinated plants in Britain and the Netherlands”. Science. 313 (5785): 351–354. doi:10.1126/science.1127863. PMID 16857940. ^ Cox-Foster, DL; Conlan, S; Holmes, EC; Palacios, G; Evans, JD; Moran, NA; et al. (2007). “A metagenomic survey of microbes in honey bee colony collapse disorder”. Science. 318 (5848): 283–287. doi:10.1126/science.1146498. PMID 17823314. ^ Woteki, Catherine (August 16, 2013). “The road to pollinator health”. Science. 341 (6147): 695. doi:10.1126/science.1244271. PMID 23950499. 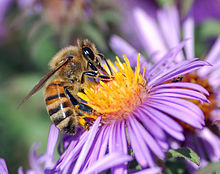 ^ “EFSA Press Release: EFSA identifies risks to bees from neonicotinoids”. Efsa.europa.eu. 2013-01-16. Retrieved 2014-04-18. ^ “ISCA Technologies: A Leader of Innovative Pest Management Tools and Solutions”. Iscatech.com. Archived from the original on 2014-04-10. Retrieved 2014-04-18. ^ a b c d Neuschulz, Eike Lena; Mueller, Thomas; Schleuning, Matthias; Böhning-Gaese, Katrin (2016-07-20). “Pollination and seed dispersal are the most threatened processes of plant regeneration”. Scientific Reports. 6 (1): 29839. doi:10.1038/srep29839. PMC 4951728. PMID 27435026. ^ a b Carvalho, Carolina S.; Galetti, Mauro; Colevatti, Rosane G.; Jordano, Pedro (2016-08-18). “Defaunation leads to microevolutionary changes in a tropical palm”. Scientific Reports. 6: 31957. doi:10.1038/srep31957. PMC 4989191. PMID 27535709. ^ a b c d Connolly, Christopher N. (2013-09-01). “The risk of insecticides to pollinating insects”. Communicative & Integrative Biology. 6 (5): e25074. doi:10.4161/cib.25074. PMC 3829947. PMID 24265849. ^ a b Potts, Simon G.; Biesmeijer, Jacobus C.; Kremen, Claire; Neumann, Peter; Schweiger, Oliver; Kunin, William E. (2010). “Global pollinator declines: trends, impacts and drivers”. Trends in Ecology & Evolution. 25 (6): 345–353. CiteSeerX 10.1.1.693.292. doi:10.1016/j.tree.2010.01.007. PMID 20188434. ^ a b Fairbrother, Anne; Purdy, John; Anderson, Troy; Fell, Richard (2014-04-01). “Risks of neonicotinoid insecticides to honeybees”. Environmental Toxicology and Chemistry. 33 (4): 719–731. doi:10.1002/etc.2527. PMC 4312970. PMID 24692231. ^ Humpden, Nyamweya N.; Nathan, Gichuki N. (2010-06-01). “Effects of plant structure on butterfly diversity in Mt. Marsabit Forest – northern Kenya”. African Journal of Ecology. 48 (2): 304–312. doi:10.1111/j.1365-2028.2009.01151.x. ^ Tylianakis, Jason M. (2013-03-29). “The Global Plight of Pollinators”. Science. 339 (6127): 1532–1533. doi:10.1126/science.1235464. PMID 23449995. ^ a b Sluijs, Jeroen P. van der; Vaage, Nora S. (2016-06-01). “Pollinators and Global Food Security: the Need for Holistic Global Stewardship”. Food Ethics. 1 (1): 75–91. doi:10.1007/s41055-016-0003-z. ^ a b Eilers, Elisabeth J.; Kremen, Claire; Greenleaf, Sarah Smith; Garber, Andrea K.; Klein, Alexandra-Maria (2011-06-22). “Contribution of Pollinator-Mediated Crops to Nutrients in the Human Food Supply”. PLOS ONE. 6 (6): e21363. doi:10.1371/journal.pone.0021363. PMC 3120884. PMID 21731717. ^ Bascompte, J.; Jordano, P.; Melián, C. J.; Olesen, J. M. (2003). “The nested assembly of plant–animal mutualistic networks”. Proceedings of the National Academy of Sciences. 100 (16): 9383–9387. doi:10.1073/pnas.1633576100. PMC 170927. PMID 12881488. ^ Bastolla, U.; Fortuna, M. A.; Pascual-García, A.; Ferrera, A.; Luque, B.; Bascompte, J. (2009). “The architecture of mutualistic networks minimizes competition and increases biodiversity”. Nature. 458 (7241): 1018–1020. doi:10.1038/nature07950. PMID 19396144. ^ a b c Lever, J. J.; Nes, E. H.; Scheffer, M.; Bascompte, J. (2014). “The sudden collapse of pollinator communities”. Ecology Letters. 17 (3): 350–359. doi:10.1111/ele.12236. hdl:10261/91808. PMID 24386999. “Pollination” . Encyclopædia Britannica (11th ed.). 1911.